Our batteries are 7200mAh compared to the original Sony battery, allowing you to stay ready to capture the perfect shot. • 1x NP-F970 7200mAh L Series Battery. Filter Accessories. Bag Accessories. Sony Compatible. The LCD display shows battery charging status clearing. DetachableNP-F970 battery plates suitable for Sony NP-F550/F750/F950/ NP-FM50/FM500H/QM71 & etc camcorder batteries. LCD display show battery power level and charging status. Products are Sony compatible and not endorsed by Sony, Inc. colour: black. New decoding! Show battery! 100% compatible! Compatible models Note: Light shooting and different displays may cause the color of the item in the picture a little different from the real thing. Capacity: 7800mAh. Compatible With:For Sony NP-F960 NP-F970 Battery. Battery Type: Li-ion. 1 x NP-F960 NP-F970 battery. There are NO EXCEPTIONS! Our Service. (batteries not included). Loading Capacity: 6pcs AA battery. 1 BB-6 AA Battery Case. Can be used universally for LED video lights below 15W. Battery Installation Order: From inside to outside. Power as NP-F550/NP-F750 etc. Yongnuo YN360 YN600 YN900 YN300 Series. Battery Compatible With : SONY NP-F750, F970, F550, F930, F960. Battery Model : F970 Battery 6600mAh. Capacity: 6600mAh. 1 x NP-F970 Battery 6600mAh. Type : Lithium Batteries. Model: NP-F960/F970. Actual Capacity: 6600 mAh. Marked Capacity: 6600 mAh. Battery Type: Li-ion. Color: Black. Our batteries are 7200mAh compared to the original Sony battery, allowing you to stay ready to capture the perfect shot. • 2x NP-F970 7200mAh L Series Batteries. Lens Hoods. Lens Hood Accessories. Filter Accessories. Yongnuo YN360 YN600 YN900 YN300 Series. For NP-F550 F750 F970 Battery. 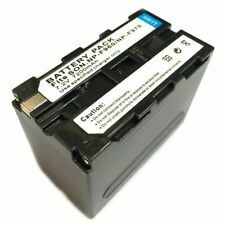 Battery Compatible With : SONY NP-F750, F970, F550, F930, F960. Battery Model : F970 Battery 6600mAh. Capacity: 6600mAh. 2 x NP-F970 Battery 6600mAh. Capacity: 7500mAh. SONY BC-V615 SONY DCM-M1 SONY DCR-TRU47E SONY MVC-CD1000 SONY PLM-100 SONY VCL-ES06A. New X1 NP-F970 Battery FOR SONY NEX-7 NEX-5N NEX-C3 NEX-3. 1 x Battery for Sony NP-F970. 2 x Battery for Sony NP-F970. Power as NP-F970 F550 for Neewer 308C,TTV-204,Pad-22 & other LED video light or moniter backup battery. Item model number: Neewer. Note:The led light and batteries are not included. Remove the batteries if the product is idle for a long periods.Note:The led light and batteries are not included. Capacity: 7800mAh. Compatible With:For Sony NP-F960 NP-F970 Battery. Battery Type: Li-ion. 1 x NP-F960 NP-F970 battery. Main Feature. Top-Max 6900mAh Replacement NP-F970 CCD-SC55 CCD-SC65 CCD-TR67 for Sony. Condition is New. Dispatched with Royal Mail 1st Class. SONY BC-V615 SONY DCM-M1 SONY DCR-TRU47E SONY MVC-CD1000 SONY PLM-100 SONY VCL-ES06A. 4 x NP-F970 Battery FOR SONY NEX-7 NEX-5N NEX-C3 NEX-3. 1 x Battery for Sony NP-F970. 2 x Battery for Sony NP-F970. Yongnuo YN360 YN600 YN900 YN300 Series. Battery Compatible With : SONY NP-F750, F970, F550, F930, F960. Battery Model : F970 Battery 6600mAh. Capacity: 6600mAh. 2 x NP-F970 Battery 6600mAh. Type : Lithium Batteries. Capacity: 7500mAh. SONY BC-V615 SONY DCM-M1 SONY DCR-TRU47E SONY MVC-CD1000 SONY PLM-100 SONY VCL-ES06A. SONY CCD-SC (Hi8) Series. SONY DCR-TR7 Series. SONY DCR-TV Series. SONY DCR-VX (MiniDV) Series. Genuine Sony NP-F970 Battery NP-F970 Camera Photography Light Monit P6V9. Condition is Used. Dispatched with Royal Mail 1rst Class. SONY BC-V615 SONY DCM-M1 SONY DCR-TRU47E SONY MVC-CD1000 SONY PLM-100 SONY VCL-ES06A. 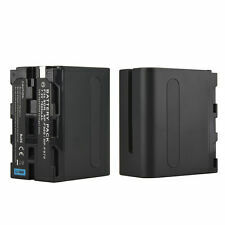 2 x NP-F970 Battery FOR SONY NEX-7 NEX-5N NEX-C3 NEX-3. 1 x Battery for Sony NP-F970. 2 x Battery for Sony NP-F970. Capacity: 2500mAh. 2 X Battery for Sony NP-F330 NP-F530 NP-F550 NP-F570 FD71 FD71 FD75 M1 FD81 FD83. PLM-A35, PLM-100 . MVC-FDR3E MVC-CD1000. MVC-FD90, MVC-FD91, MVC-FD95, MVC-FD97 MVC-FD100, MVC-FD200 MVC-FDR1 MVC-FDR1E MVC-FDR3. Capacity: 7800mAh. 1500mAh NP-FW50 Battery For Sony Alpha 7 7R a7R a7S a3000 a5000 a6000 NEX-5N A55. NP-40/NP-40N Li-ion Battery For Fujifilm FinePix F460/F480/F610/F811/F710/Z5fd. Compatible With:For Sony NP-F960 NP-F970 Battery. Capacity: 7800mAh. 1500mAh NP-FW50 Battery For Sony Alpha 7 a7 7R a7R 7S a5000 a6000 NEX-5N 5C A55. 2x NP-FW50 Batterie Ladegerät Für Sony Alpha 7 a7 7R a7R a7S a3000 a5000 a6000. Compatible With:For Sony NP-F960 NP-F970 Battery. Capacity : 7800mAh (LG 18650 Cell). SONY BC-V615 SONY DCM-M1 SONY DCR-TRU47E SONY MVC-CD1000 SONY PLM-100 SONY VCL-ES06A. Load on the USB port of a laptop, a PC or using a Powerbank, Load on the sector. Battery Type : Lithium ion. Load on the USB port of a laptop, a PC or using a Powerbank, Load on the sector. SONY BC-V615 SONY DCM-M1 SONY DCR-TRU47E SONY MVC-CD1000 SONY PLM-100 SONY VCL-ES06A. Connect the USB plug to any 5V power source. (SONY : NP-F330, NP-F530, NP-F550, NP-F570, NP-F750, NP-F770, NP-F930, NP-F930/B, NP-F950, NP-F950/B, NP-F960, NP-F970, NP-F970/B. It is very important. 2) We only warranty for defective products. HDR-FX1 HDR-FX1E HVR-Z1U. 1 X NP-F970 to EN-EL14 Dummy Battery Adapter with 1/4" Screw. 1 X 1/4" Hot Shoe Mount. Cable Length: 136cm / 53.5in. Main Material: Aluminum alloy and plastic. With an indicator light, red for low power condition. Plug Socket: DC5.5 2.1mm & DC4.0 1.7mm. 1 NP-F970 to EN-EL15 Dummy Battery Adapter with 1/4" Screw. 1 1/4" Hot Shoe Mount. Main Material: Aluminum alloy and plastic. 2X(Built-in imported A-class large-capacity high-quality batteries, to ensure the provision of high-quality electric energy, long life, advanced technology, reliable quality, long working hours and so on.Built-in PCM intelligent battery protection circuit, with over-charging, over-discharge, over-current (short-circuit) overheating four-fold protection.Using SMT lead-free process, in line with environmental requirements.The charging process can be completed quickly, completely without memory effect, convenient and fast.New decoding! Show battery! 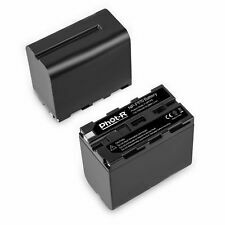 100% compatible!Type: Li-ionVoltage: 7.2VCapacity: 7200mAhFor Sony/Sony Digital Camera Battery NP-F960/F970Compatible models: SONYNP-F750NP-F530NP-F570NP-F930/BNP-F950NP-F550NP-F970NP-F770NP-F930NP-F330NP-F950/BNP-F.
Built-in imported A-class large-capacity high-quality batteries, to ensure the provision of high-quality electric energy, long life, advanced technology, reliable quality, long working hours and so on.Built-in PCM intelligent battery protection circuit, with over-charging, over-discharge, over-current (short-circuit) overheating four-fold protection.Using SMT lead-free process, in line with environmental requirements.The charging process can be completed quickly, completely without memory effect, convenient and fast.New decoding! Show battery! 100% compatible!Type: Li-ionVoltage: 7.2VCapacity: 7200mAhFor Sony/Sony Digital Camera Battery NP-F960/F970Compatible models: SONYNP-F750NP-F530NP-F570NP-F930/BNP-F950NP-F550NP-F970NP-F770NP-F930NP-F330NP-F950/BNP-F970. Integrated microchip prevents overcharging, overheat & provide short circuit protection. Sony NP-F330, NP-F530, NP-F550, NP-F570, NP-F730, NP-F750, NP-F770, NP-F930, NP-F930/B. Suitable For PLM-100(Glasstron) PLM-50(Glasstron) PLM-A35(Glasstron) PLM-A55(Glasstron). Capacity : 7800mAh. HVR-HD1000U,HVR-M10C(Videocassette Recorder), HVR-M10E(Videocassette Recorder), HVR-M10N(Videocassette Recorder). HVR-M10P(Videocassette Recorder),HVR-M10U(Videocassette Recorder ). Capacity: 7.2V 7200mAh. Battery type: lithium ion battery. Applicable models: for Sony CCD-SC5, CCD-SC55, CCD-SC65, DCR-SC100, CCD-TR917, CCD-TRV101, CCD-TRV15, CCD-TRV25, CCD-TRV36, CCD-TRV36 TRV. Interface: micro-USB input / Type-C input / USB output interface / Hide the charging cable. Can put in 6pc AA Batteries, then works equivalent as Sony NP-F970 Battery. 1,The real color of the item may be slightly different from the pictures shown on website caused by many factors such as brightness of your monitor and light brightness. SONY NP-F330 NP-F530 NP-F550 NP-F570 NP-F750 NP-F770 NP-F930 NP-F930 / B NP-F950 NP-F950 / B NP-F960 NP-F970 NP-F970 / B. 2x 7800mAh Battery NP-F9 70 For Sony Hi8 MiniDV CAMCO RDER. Capacity: 7800mAh. SONY BC-V615 SONY DCM-M1 SONY DCR-TRU47E SONY MVC-CD1000 SONY PLM-100 SONY VCL-ES06A. SONY CCD-SC (Hi8) Series. SONY DCR-TR7 Series. Capacity: 8400mAh. BATTERY FOR SONY NP-F970. SONY: NP-F330, NP-F530, NP-F550, NP-F570, NP-F730, NP-F750, NP-F770, NP-F930. 1x Battery. THE SET INCLUDES.